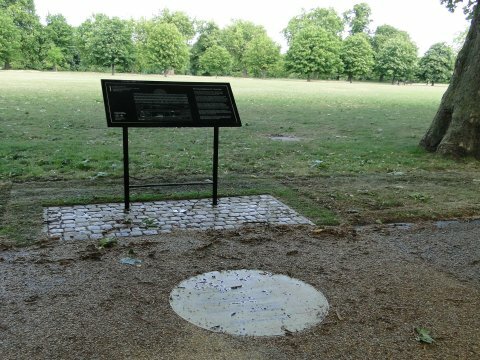 Commemorating the site of the Great Exhibition, in 1851, and to celebrate 160 years of London's Royal Parks, five plaques have been unveiled on 10 May 2011 in Hyde Park. The plaques, designed by Virginia Nimarkoh mark out the original site which is ten times the area of St Paul's Cathedral. Each plaque contains interesting facts about the original exhibition. For example the exhibition was visited by more than six million people over the five and a half months that it was open. To create the glass and steel structure of the original Crystal Palace, 293, 655 panes of glass were used. The value of the exhibits, excluding the Koh-i-Noor diamond, was around two million pounds. 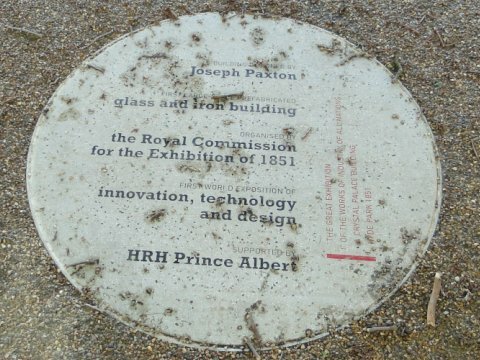 The project to erect the concrete and recycled glass plaques was funded by the Royal Commission for the Royal Parks. Virginia Nimarkoh is an artist based in London. Site of the Great Exhibition. The aerial view shows part of Hyde Park. Part of The Serpentine (top right) can be seen, along with the Road through the park (far left). The roads ends (letter E) at the gates opposite Exhibition Road. Knightsbridge (labelled) runs along the bottom of the image. The tall building, casting a long shadow is the Knightsbridge Barracks (letter K). The site is now open grass, lined by trees. Five markers have been placed on the footpaths. The four markers (shown in red) on the upper image record the four corners of the structure. The fifth marker (shown in green) records the main entrance to the building, along with a plaque mounted on two posts, which is shown below. The accompanying plaque on the ground is also shown. All five round plaques carry different facts about the Great Exhibition. The view above is of the entire site of the Crystal Palace, It was taken from the approximate site of the eastern edge of the building and looks west with the Albert Memorial in the distance. After so many years since the Great Exhibition was held, it is high time that these markers were placed in Hyde Park. 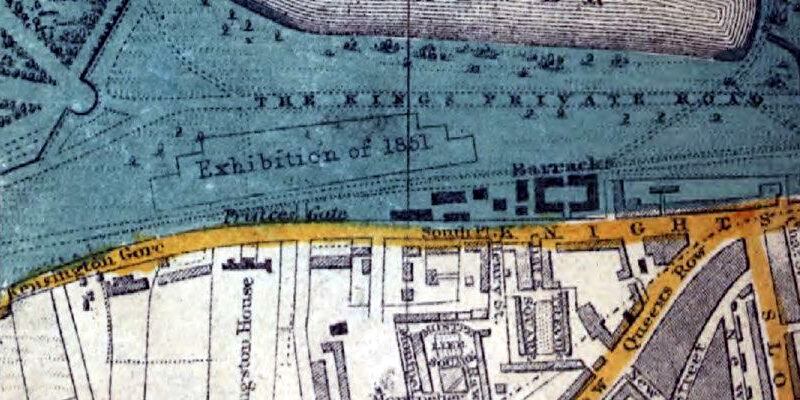 Shown above is part of a map of London by Smith in 1860. By then the Great Exhibition had been removed from Hyde Park and rebuilt, in 1854, on the top of a large hill at Sydenham, now part of an area called Crystal Palace. For some reason, best known to the mapmaker, the outline of the structure is still shown in the park - nine years after the event!